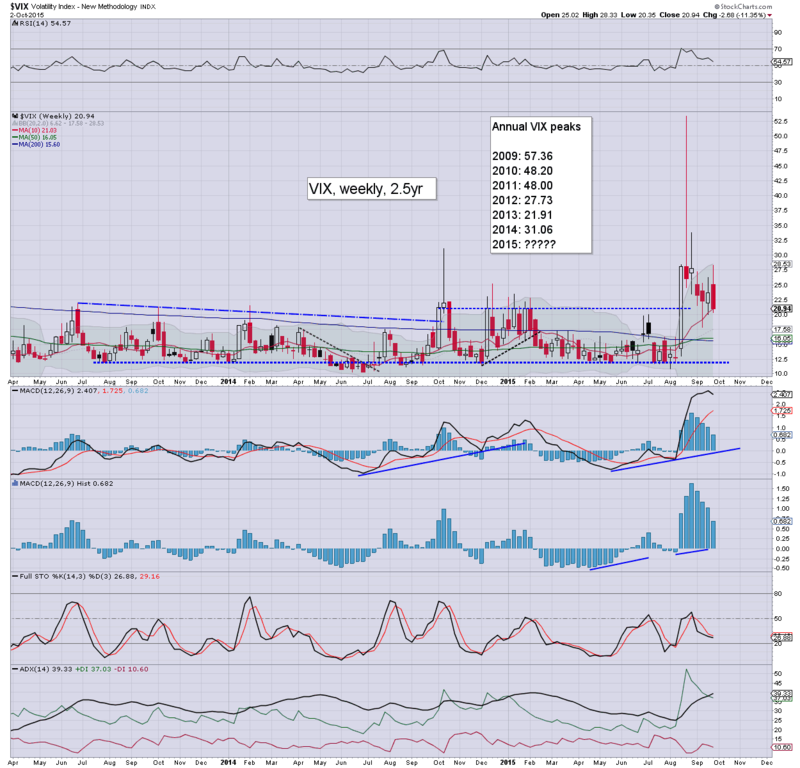 With most equity indexes closing significantly higher, the VIX remained in cooling mode, settling -7.1% @ 20.94. There was a notable flash-print low of 20.35. Price structure on the hourly cycle is offering a big bull flag, with viable upside to the 27s by next Tue/Wed. 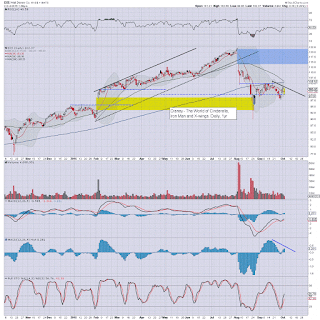 The 30 threshold looks out of range, unless <sp'1867. 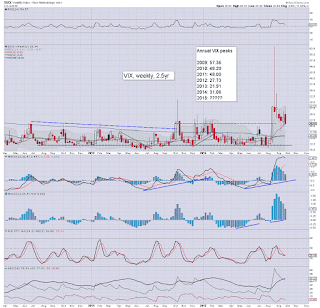 Suffice to note... VIX has been in cooling mode since the Tuesday equity low of sp'1871. All things considered, the VIX looks set for renewed upside into the middle of next week... before cooling into VIX opex of Oct' 14th. To be clear though, if sustained action >sp'1950 across next Mon-Wed, then a straight run to the 200dma in sp'2060/50s will be due, and that would equate to VIX losing the 20 threshold, and likely holding the mid teens for some weeks. 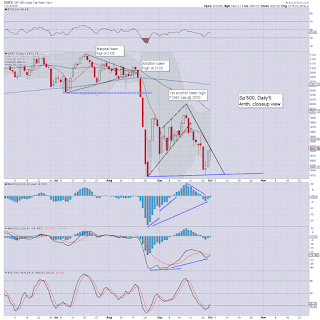 *closing hour action: another crazy short-stop cascade.. with a new intra high. What was the excuse? Did the earlier bad jobs news now become good news? ... and another wild week in this twisted casino comes to a close. Frankly, I think it was the hardest trading week since 2011. It is pretty bizarre to see the market hyper-ramp 58pts (2.9%) across just six trading hours. *Yours truly managed to cash out gains in AAPL-short and DAL-short... so that was something. I hold DIS and GE short.. along with VIX-long across the weekend. 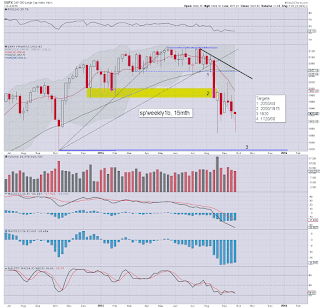 Most US equity indexes are set to close net lower for the third consecutive week. 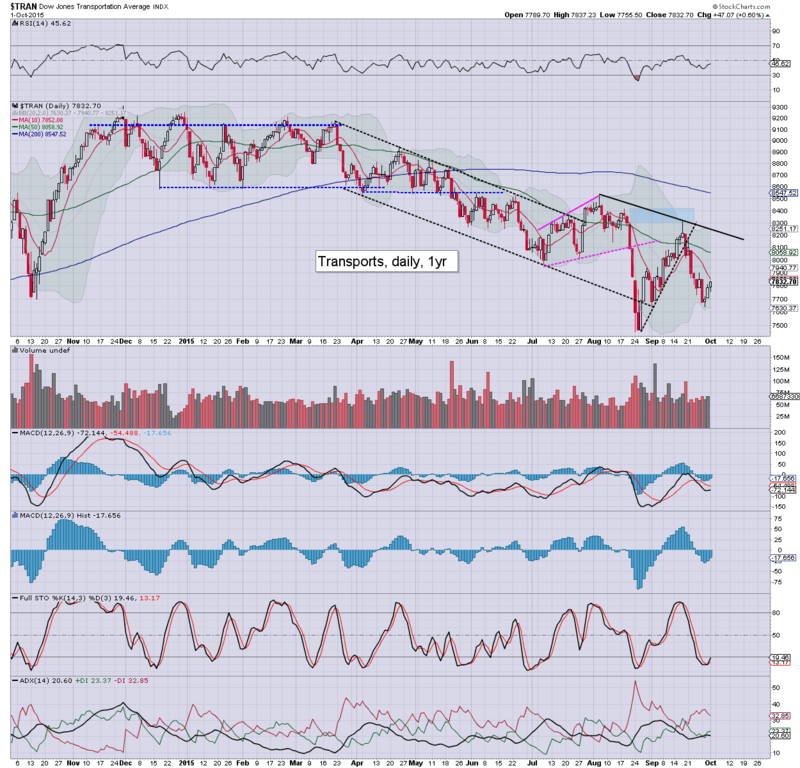 The two leaders - Trans/R2K, remain leading the way lower.. and are suggestive of another push down.. before some kind of multi-week up cycle can begin. Regardless of the close... it has not been a dull week! The smaller 5/15/60min equity cycles are highly suggestive of a rollover into the weekly close. In any case... its been a pretty crazy day.. and week. 3.20pm.. so.. with sp'1942.. that is the level from overnight Wed' futures. A 49pt ramp from the morning low....2.4%.. based on.... NOTHING. Any sustained action >1950.. and we're going another 100pts higher. Best guess is ... no... but I realise many would argue otherwise. US equities break a new intra peak of sp'1935... as equity bears have been ground out from an early low of 1893. 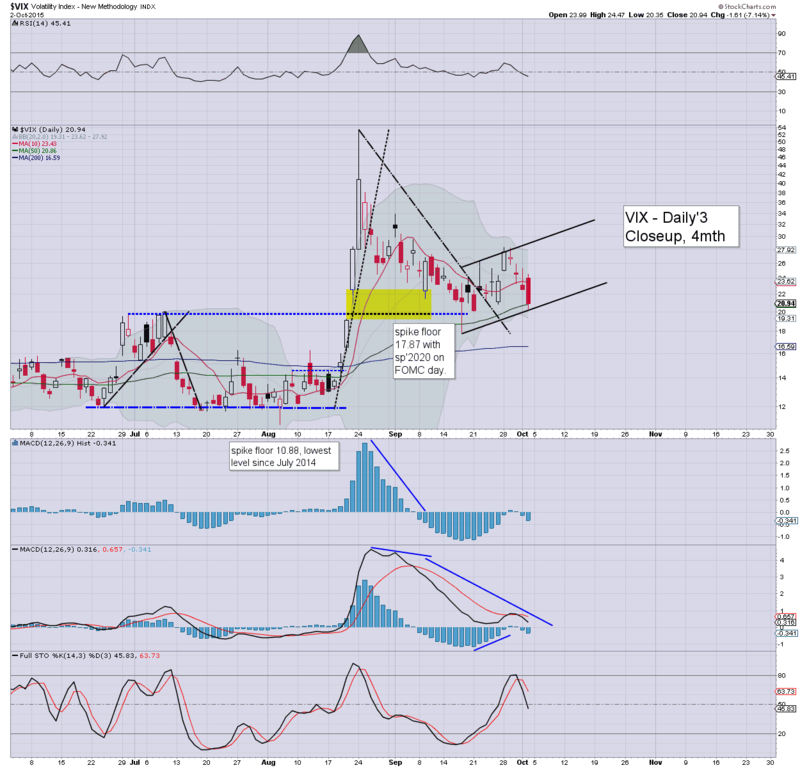 VIX remains subdued in the 22/21s.... but the micro 5/15/60min cycles are all set for upside across next Mon-Tuesday. Q. Price structure on the VIX, a big bull flag.. with a corresponding big bear flag on the sp'60min cycle? If yes.. then it'd bode not just for sp'1867.. but at least 1850.. if not the Oct'2014 low of 1820. 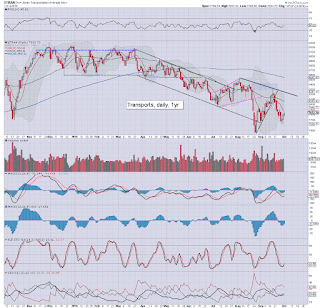 With the R2K (following the Dow/Trans in August) seemingly headed for the Oct'2014 low of 1040... the sp'500 could yet hit 1820 before first opportunity of a multi-week up cycle. Anyway.. its just a scenario to consider. 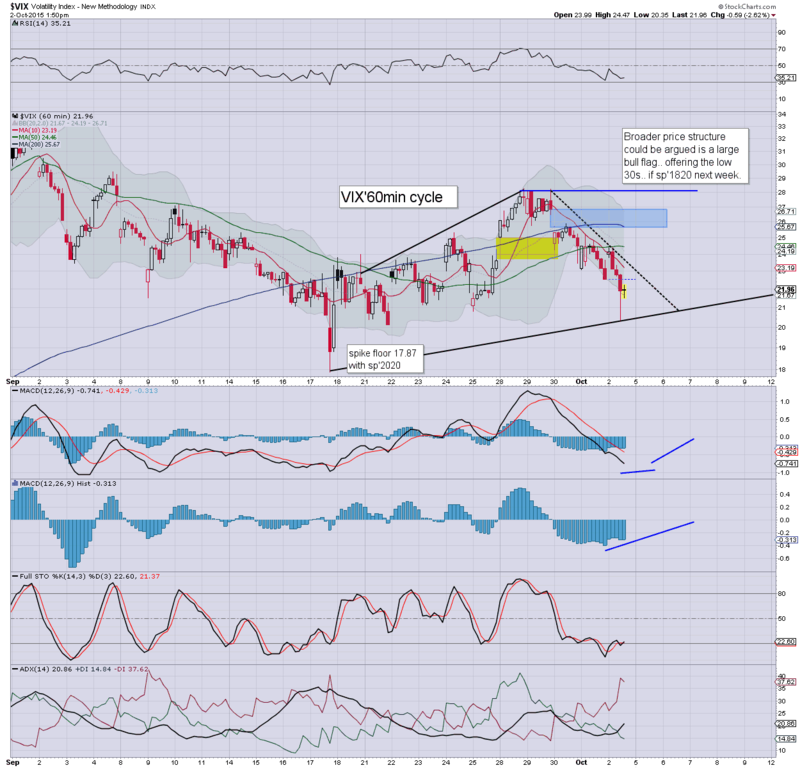 I remain short- DIS... and considering the VIX and overall price structure, I will hold short into next week. 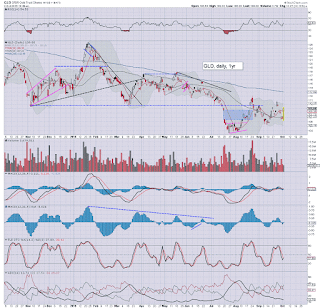 First target are the $97s. With US equity indexes turning positive, with a new high of sp'1930, the VIX has seen a sporadic flash-print, hitting 20.35.. before immediately rebounding. Regardless, from a pure cyclical perspective, the smaller 5/15/60min cycles are all on the very low side... the VIX is set for upside early next week. 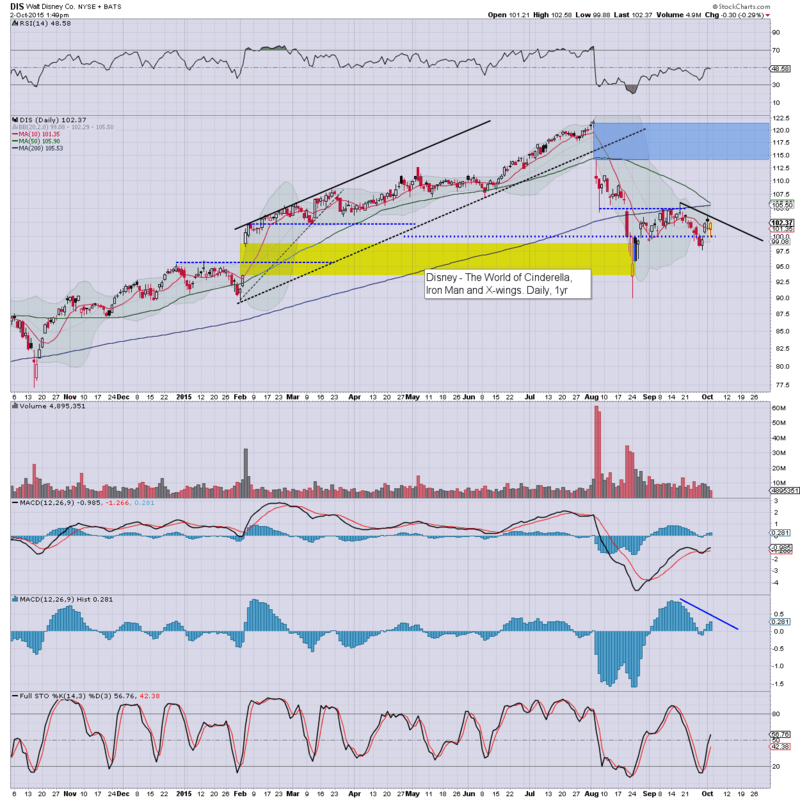 *I remain long-VIX, and considering the price structure... and overall equity action (not least the earlier break <sp'1900)... I will be content to hold VIX across the weekend.. along with DIS and GE.. both short. So.. with sp' @ 1930, everything is fine again? 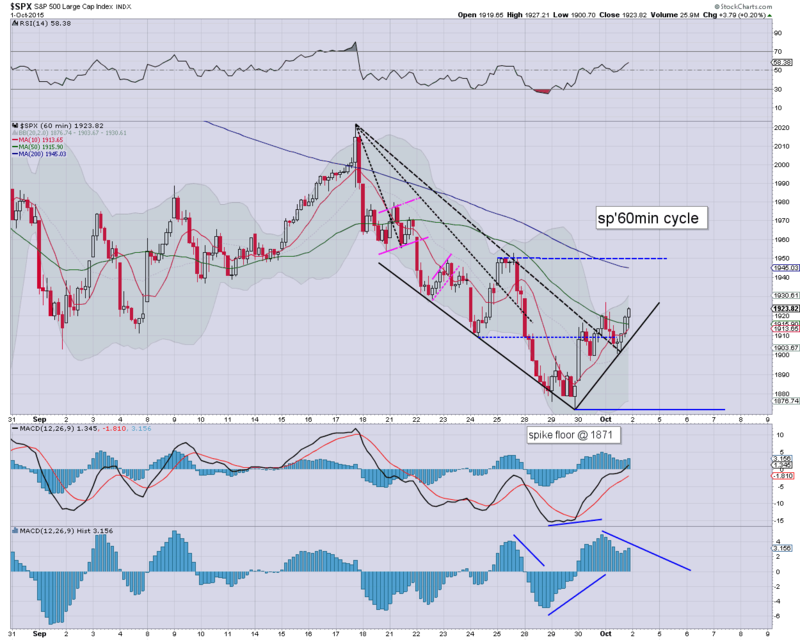 With 3 hours still to go.. there is plenty of time for another down cycle.. at least to get close to 1910/00 zone. I admit.. a weekly close <1900 now looks overly difficult. 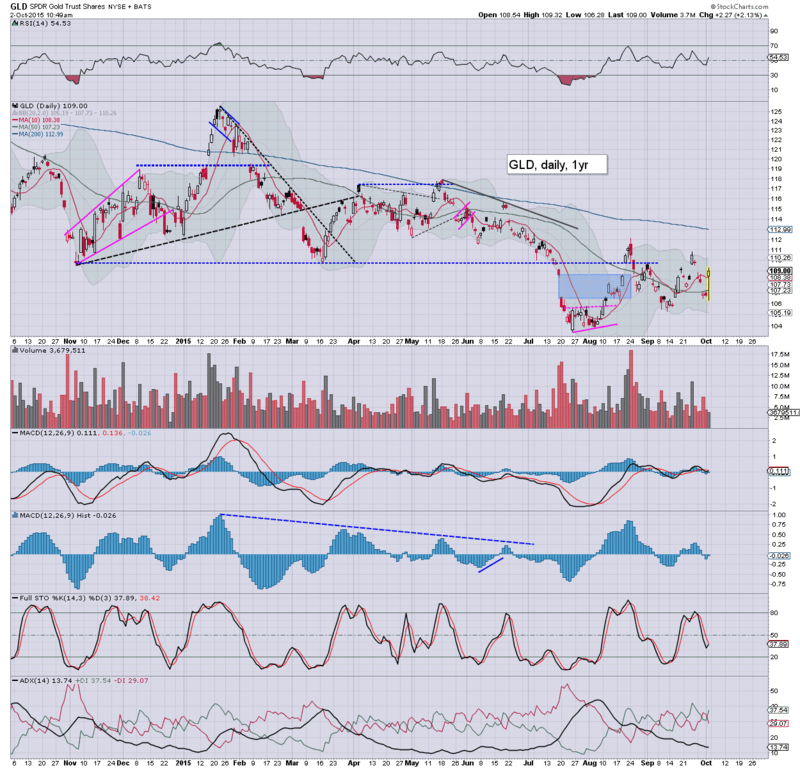 notable strength: GDX, +5.5%.. as Gold +$21. 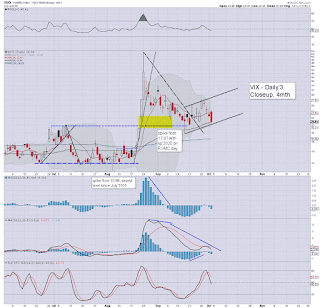 1.24pm.. VIX trying to put in a (ignoring the flash-print) low of 21.52.... 22s will be provisional break UP. Overall.. crazy day.. but then.... its October.... a typically wild month. 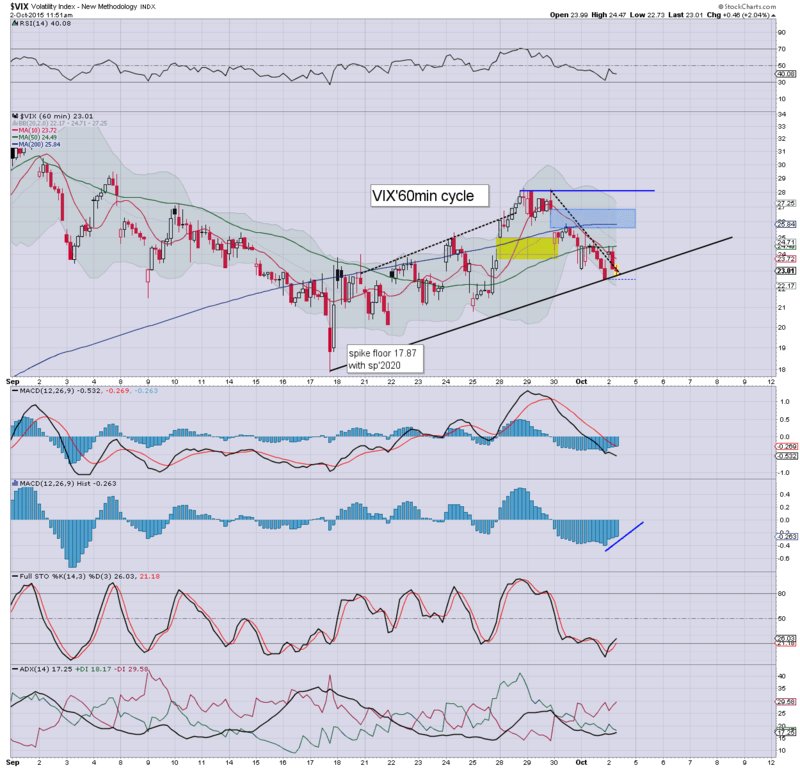 US equities have bounced from a morning low of sp'1893 to 1917.. with VIX cooling to 22.73. Equity bears should be seeking a weekly close <1900.. along with VIX 24/25s.. to keep the door open to 1867.. and lower next week. The rest of today... will be rather important. *Fed officials Fischer and Bullard are due across the next two hours... and Mr Market will be listening. 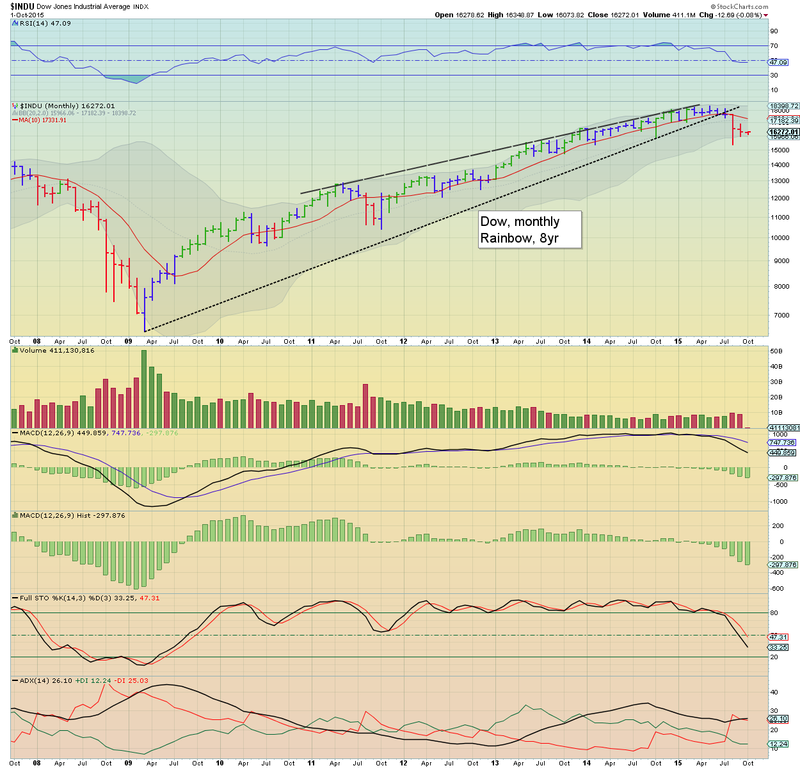 All things considered, a break back under sp'1900 looks probable. .. ohh.. and I receive a shoutout. Is that bullish? 12.30pm.. the micro 5/15min VIX cycles... extremely low... we're due a turn. 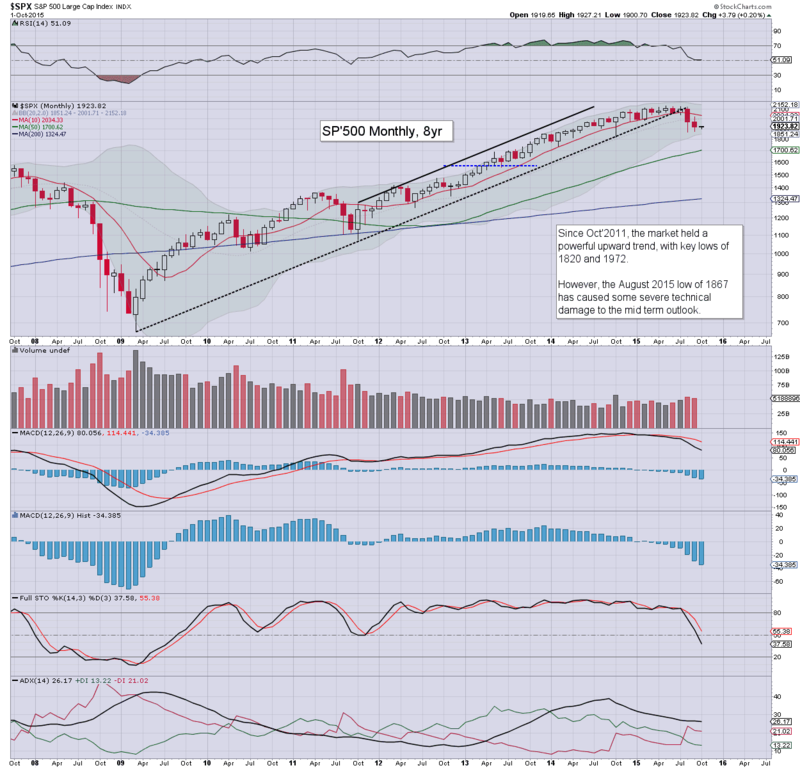 sp'1926.... pretty crazy... as bears short-stopped out. 12.37pm.. Crazy algo-bots.... VIX back 22.20s.... a move into the 23s will confirm a turn. 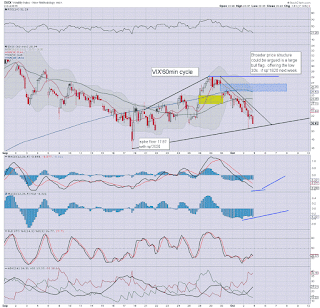 *I hold long-VIX.. will very likely hold across the weekend.. with price structure as it is. US equities remain significantly lower, but as ever... the bull maniacs are out there... trying to find an entry level... helping to negate half of the declines. First target remains 1870/67.. with VIX 27s. With the USD -0.8% in the DXY 95.40s, there is a notable hyper-reversal in Gold from -$7 to +$23. All cycles currently favour the equity bears into the weekly close. It makes little sense that the market won't at least test the 1867 low.. and in theory.. a marginally lower low around sp'1850 would be rather natural... although that seems out of range today. *I remain short DIS, GE, and long-VIX.. seeking to 'clear the decks' before the weekend... but if price action looks okay.. I could just about stomach holding into Monday.... not least as I've now dropped DAL. With the monthly jobs data coming in much lower than expected (along with lower revisions) the capital markets are upset. The sp' has decisively failed to hold the key 1900 threshold, and now looks headed for 1870/67 in the immediate term... and that should equate to VIX 27/28s. *EXITED DAL-SHORT.. from $43.45.. so that is 2 positions gone... 3 to go. 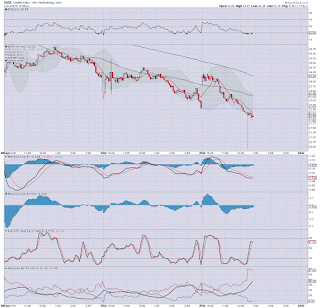 So.. we flipped from sp +14pts @ 8.29am to -28pts... and things look increasingly bearish. 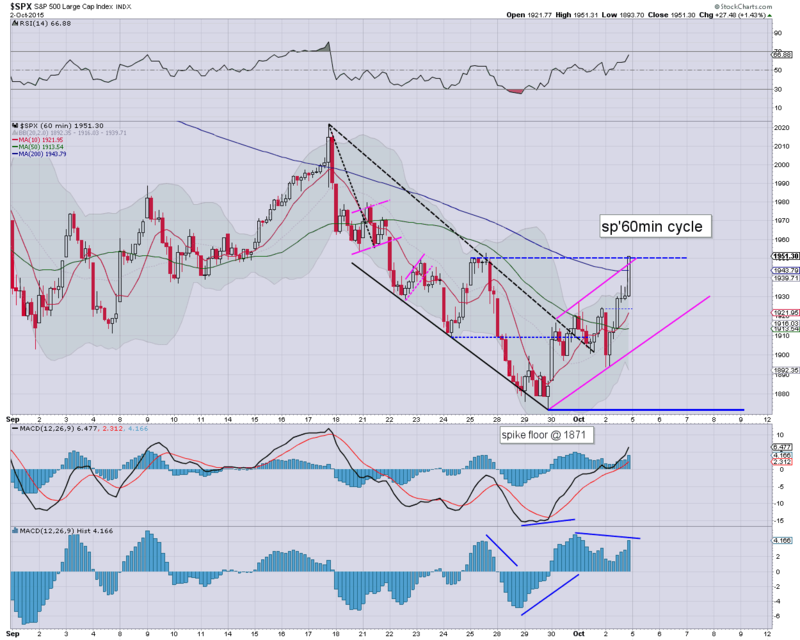 Hourly cycles are set for bearish breaks this hour.... and in theory we should hit sp'1880 - with VIX 26s.. by lunch time. The weekly candles are looking a lot better - from a bearish perspective... the Oct'2014 low of 1820 is viable in theory. Anyway.. first things first.. lets see if we can get to 1870/67 this afternoon. 10.02am.. Factory orders, -1.7%... lousy number. Good morning. US equity futures are moderately higher (ahead of the jobs data), sp +9pts, we're set to open at 1932. 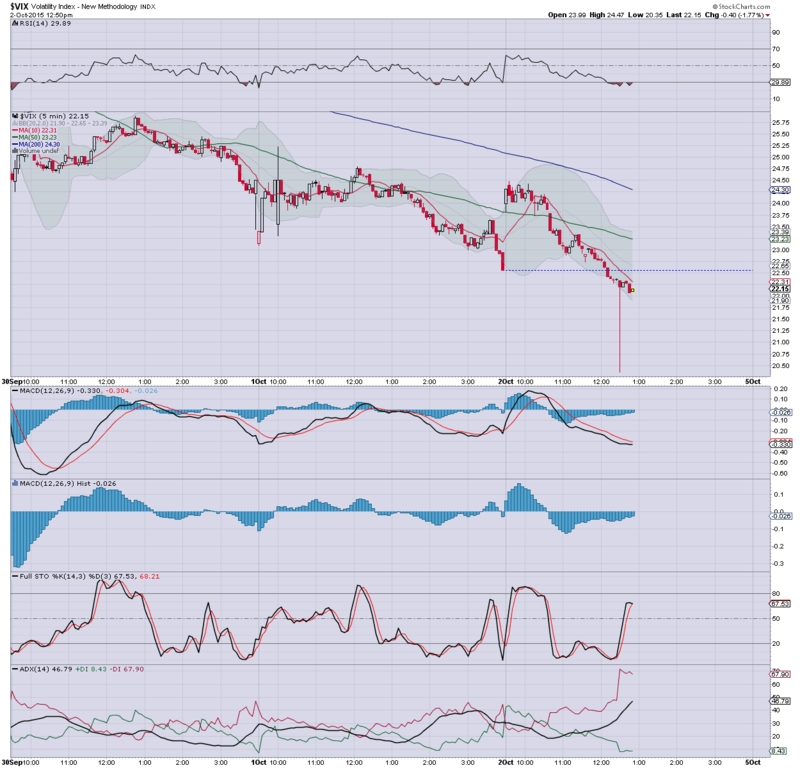 USD is +0.1% in the DXY 96.20s. 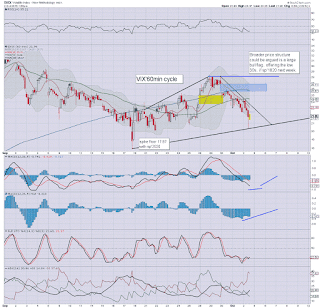 Metals remain weak, Gold -$7... the $1100 threshold is set to be tested. Oil is broadly flat. Little to add... ahead of the jobs data. As ever, it will not be the number itself that matters... but how the market interprets it. If we don't break under sp'1900 today... it would bode badly for the equity bears next week, and will threaten a straight run to the 200dma in the 2050s by late Oct/early Nov.
Bad news is bad news... really? 8.41am.. sp -18pts.... 1905..... almost there. Watching Ms. Swonk on clown finance TV.. she feels like she is in quicksand. Well, she never did see 2008 coming either. At least she is consistent in her failure. notable strength, TVIX +5%... but really. that is still a small move. Can the VIX get to 27/28s today? Technically.. it IS possible.... right now.. it'd imply a BREAK under 1867... if 27s - relative to yesterdays' lackluster VIX. .. but don't worry.. the Bernanke is on CNBC next Monday. He will make it all better..yes? 9.14am.. sp -24pts.. 1899.. so we have a threshold break. 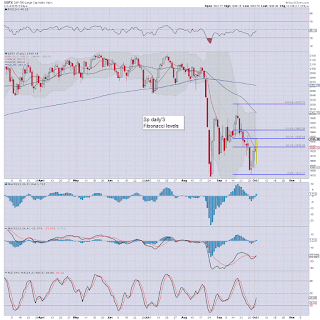 In theory.. we should be -55pts.. around 1870/67 this afternoon.. with VIX 27/28s. 9.16am.. sp -27pts... 1896.. its pretty decisive now. Eyes on the VIX +8% in the 24.50s ... first target 27s. Whilst Thursday saw some relatively moderate equity price swings, with a new month.. the giant monthly cycles have a new candle. For the chart maniacs out there, it should be absolutely clear that underlying price momentum continues to increasingly favour the equity bears. 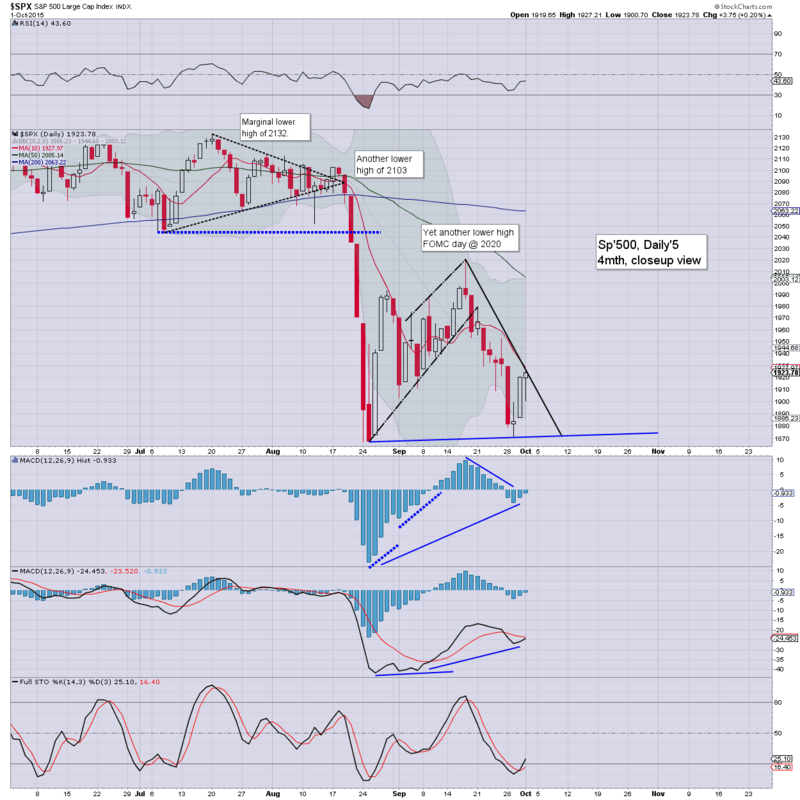 re: sp'500. 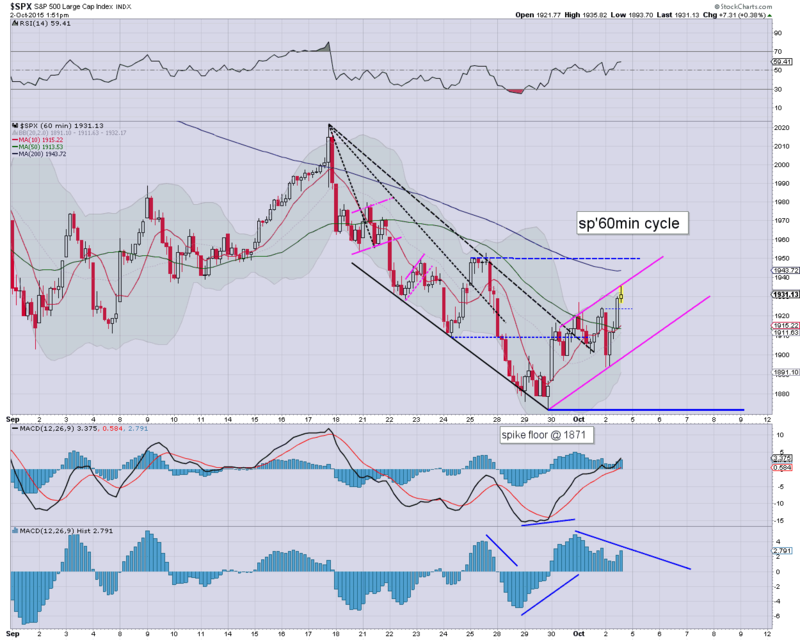 First, note the MACD (blue bar histogram) cycle.. now at levels not seen since May 2009. Second, the lower bollinger is around 1850, and offers rather strong support in the near term. 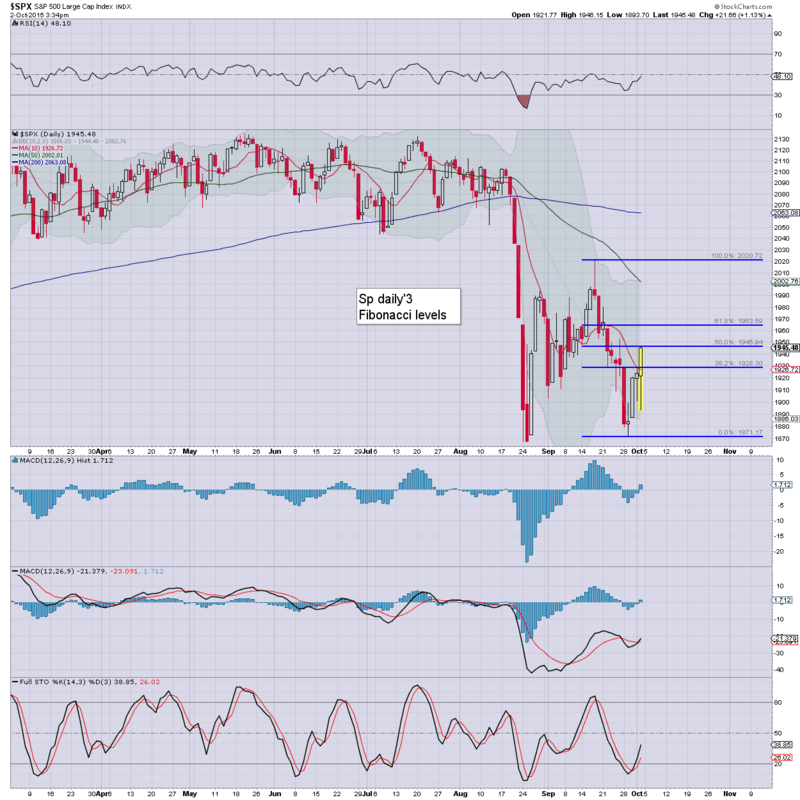 In terms of upside resistance... we have the 10MA @ 2034. Lets be clear.. until we see a monthly close >2030, the bull maniacs are facing a major problem. For the moment... the default trade remains to the short side. On the smaller daily cycle time frame.. the 200dma (2063) is arguably the last line in the sand for the serious 'big bear' money. re: Dow. First, note the third consecutive red candle on the 'rainbow' (Elder Impulse) chart. Can Oct' also settle with a red candle? If so.. it'd be another major support to the notion that the August break was something other than just a short term washout. Second, note the decisive break under the lower bollinger in August.. something not even seen in the initial break in late 2007/early 2008. Indeed, right now... there is reasonable justification to target a test of the Oct'2007 high of 14198... some 2000pts lower than current levels. Friday will see the latest monthly jobs data. 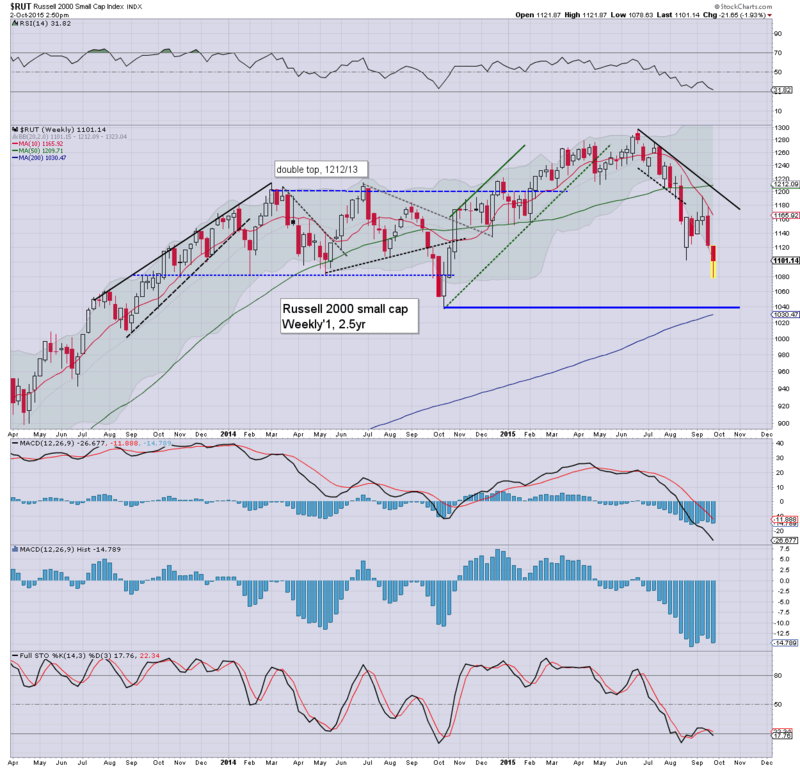 Market is expecting 203k net gains, with a static headline jobless rate of 5.1%. Other data: Factory orders (10am). *there is a wheel barrow of Fed officials speaking.. inc' Fischer and Bullard. 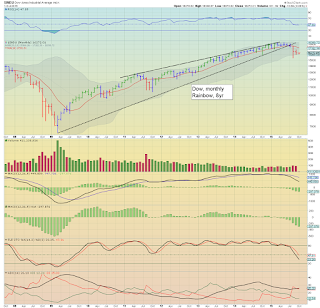 If any of them say anything to that upset Mr Market, it sure would help aid a break <sp'1900. For yours truly.. it was a better day than feared. Futures had largely cooled from overnight highs (equiv' to sp'1940). AAPL was knocked sig' lower in early trading, and I made good use of that opportunity to offload that position. Yet, I'm still left with four short-market positions (including long-VIX).. that I really want to exit. If we do break <sp'1900 tomorrow (and that sure could happen even if we open higher) and are trading in the 1880/70s by late afternoon, I'll try to offload another position or two. 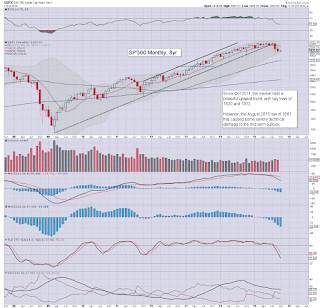 I would consider holding across into Monday, as a test of 1867.. and even a brief foray to the 1850s still looks possible. 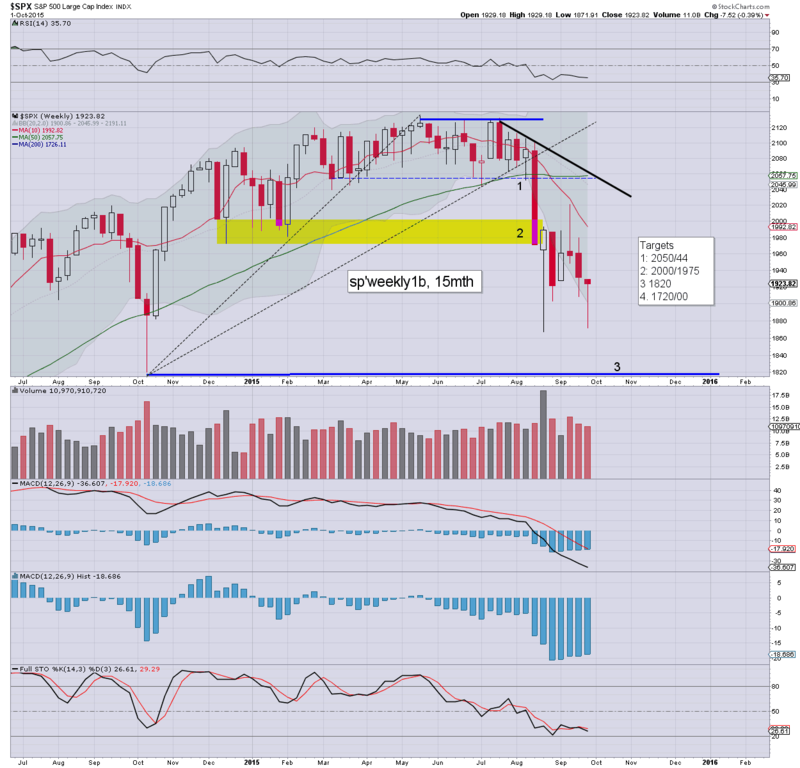 The current weekly candle is threatening a spike floor. 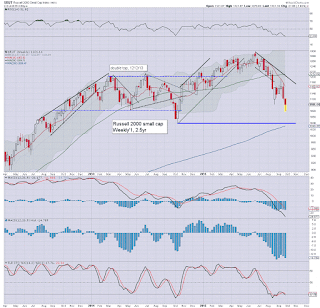 I'd really like to see a Friday close <1900... as that would keep the door open to further weakness next week. Thank the gods, its almost the weekend... I'm real tired... this week has felt like I'm carrying the world at times. ... always good to hear from some of you out there. The daily closing candles are arguably bullish, although the smaller 15/60min cycles are on the high side, and offer sig' weakness into the weekend/next Monday. Best guess... a break <1900... and then at least 1870s.